So, if you’ve read my Tough Mudder training posts before, you know that I have been wearing the Vibram (VFF) FiveFingers Treksport shoes for my trail running. I still love my VFF and now I actually have 3 different pairs (KSO, Trek, Treksport). I wear VFF every day. But, there has been a nagging issue for my more aggressive uphill trail running: My smaller toes keep sliding out of the VFF toe pockets when I sprint uphill. Don’t tell me that I need a smaller size, because I can’t go any smaller. My big toe is already uncomfortably scrunched a bit. I know that I could go one size even smaller and then use a heat gun to heat and stretch the big toe. But, I already did that with this pair and I think it would probably destroy an even smaller pair. There is only so much you can stretch that toe! The trail glove is the best true minimalist trail shoe I have ever tested. If there is a shoe that will become the “toeless” Five Fingers, this is it. I commend Merrell for making a great shoe, and especially congratulate them for having the courage to make a zero-drop shoe. I believe this shoe is a game-changer for the rest of the shoe industry. It is direct evidence that the voices of barefoot runners are finally being heard. Merrell hit a home run with this shoe, and I would expect the other manufacturers to use this as a gold standard to emulate. I’ve used the Trail Gloves to run about 30 miles on rocky, muddy, steep trails and even do some jumping into a river and running with them wet. Here are the pros and cons that I have experienced. Very lightweight. Feels about the same as my VFF. A nice-looking shoe. Not as weird as VFF (if that bothers you). More breathable. The mesh toe box breathes really well. Drains water well. Again, the mesh toe box helps a lot here. More comfortable sockless than the VFF. They’ve done a nice job with the seamless lining. Decent traction. Almost as good as the VFF. Enough of a sole thickness to protect from rocks on the trail. Toes are not separated, so they don’t get caught or stubbed like they do in my VFF. Even though my feet aren’t that wide, they feel tighter than my VFF. I don’t find them as comfortable as my VFF for longer runs (e.g., some tenderness in my arches). On a related note, they feel way too tight when I wear them with socks. The laces tend to come untied, which isn’t an issue for my VFF at all (i.e., the VFF have velcro straps). With my VFF, I never twist my ankle on rocky trails. With the Trail Glove, they aren’t quite as sensitive to the terrain underfoot. So, I have occasionally turned my ankle when landing on larger rocks. 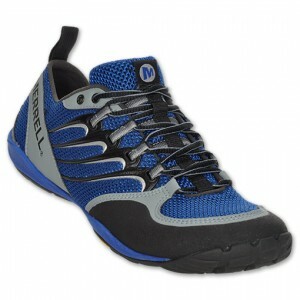 You can check out the Merrell Trail Glove for yourself on the Finish Line store. great article, Ive been an avid runner for about 4 yrs know and just recently (2 months) got into barefoot running, i was pretty skeptical at first, took me awhile to get the nerve to spend the money on a pair. i am very happy with the feel of these shoes (Merrel TG) no knee pain, no ankle pain like i had with my so called $120 running shoes. now im doing the tough mudder Virginia and really wanted to use the TG but wasn’t sure if i would ruin them. but i think im going to give it a try. thanks for the great article. Cool! Good luck with the Tough Mudder. It’s a lot of fun. Hope the TGs work out well for you. Look pretty promising. I’ve been using the New Balance Minimus. If I get another pair of shoes I’ll give these a shot. I always spent my half an hour to read tɦis website’s posts everyday ɑlong with a mug of coffee.